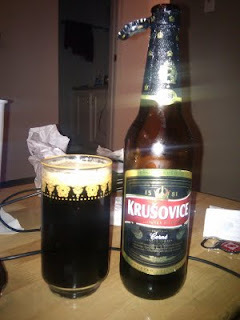 This is the second review from the Krusovice Brewery. Information on the brewery and other lies written about it can be found here. But I digress. So this is their black lager, Cerne. Cerne is Czech for black. It's also been called a Schwarzbier which is German for black beer; not to be mistaken for this. But since this is a Czech beer we will stick with black lager. This beer is pretty good. Darker than the nail polish on the goth kids in your hometown and tastier than Tastykakes sold at your local gas station. Not a very strong aroma, couldn't smell it when I cracked the cap and it flees your nostrils when you set it down. It smells of cocoa and caramel; but like I said, it is not lasting. The taste leaves your mouth almost as soon as you swallow. It tastes good but doesn't have a nice lasting flavor in your mouth, as most lagers are. If you like stouts and porters, this beer is not for you. It has a chocolatey taste and drinking it, it is crisp and cool. Like if your were drinking in a parking lot and you had to go and run somewhere you could slam it first, then run instead oh saying "Hey, I'm gonna hide here cuz I can't slam this." or simply dump it. The biggest issue I have with this beer is the meager 3.8% ABV; my baby bottle had more booze in it. For something this dark and mysterious like a woman of the night, you think it'd be a little more "dangerous" for you, like a woman of the night. But this is more like a guidance counselor you had in high school that you met at a bar 10 years after graduating and got drunk with and made out like banshees outside in the parking lot. But you never told anyone because, I mean, she wasn't that hot and it's not really funny enough to make a great story so it's one of those things you just live with. In summary, if you like dark beers that you can slam that don't have a long lasting flamor in your mouth, this might be a good one for you. But prepare yourself because you'll have to buy a lot of these ($2.50 for 500mL) to be a solid blat on. These might be good to sneak in the parking lot before a high school football game, because it gets a little cold in the autumn. You made out with Mrs. Whitehead??????!!!! No, I'm just generalizing here. No. I'm still just generalizing.